The RB-OA3 3 Studio On-Air Switcher. The RB-OA3 is a 1U rack-mount, unity gain on-air switcher, capable of switching three stereo pairs between three studios. Each studio can control the transmission path together with two peripheral paths for equipment such as a codec or hybrid and there is also a “Last studio to offer” bus, allowing for seamless and continuous broadcast from any multi-studio radio network. A “sustain” mode allows for a sustaining system, such as a PC automation system, to control the broadcast. Multiple RB-OA3 units can be connected together to switch more studios or more stereo pairs. Controls the offer/accept switching for 3 studios. Switches 3 stereo bidirectional channels, e.g. studio output,codec clean-feeds, telco feeds. Has a stereo transformer mix input, e.g. for playout system. Continuity mode allows switching to/from a PC playout system. Latching relay switching means transmission path remains intact on power-fail. 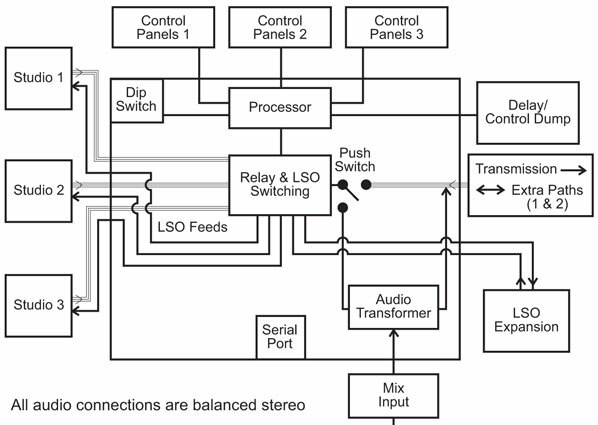 Can be expanded to switch 6 stereo channels between 5 studios. The switching is achieved using relays, except the “last studio to offer” which is switched by an analogue switch. The transmission path is switched using latching relays. This means that if there is a power failure to the unit, the transmission path will remain selected. All studios are connected using 25 way D-types for electronically balanced audio signals and control is achieved using 15 way D-types, connecting to an external control unit such as the Sonifex S2-MTBS mixer control panel. A transmission mix connection is included to mix audio which is generic to all studios into the transmission path. This could be used for jingles or adverts for example. The RB-OA3 also allows for the control of a profanity delay to be shared by all connected studios. Each studio has the ability to offer the transmission. Once offered, the transmission is fed to the other studios via the “last studio to offer” bus. The next scheduled station can then fade in the transmission and accept at the appropriate time meaning the transmission can be continuous. The “sustain” mode can be used to control an automated studio, such as an overnight music system. In this case, station control will switch to the automated system by holding the Offer button down for a number of seconds, pre-determined by a calibration routine. This will select the sustaining studio, set as studio three, which will immediately offer control back to all remaining studios. Any studio can then accept to resume orthodox broadcasting. The RB-OA3 can be expanded to switch between up to 5 studios or up to 6 stereo pairs by connecting a multiple of units together via RJ45 serial connections. With the addition of a single unit, expansion in “studio” mode allows for 2 additional studios to take control of the transmission path and additional equipment. If the expansion is made in “bus” mode, then three additional stereo channels can be added. 4 x RB-OA3 units can be connected together to switch 6 stereo pairs between up to 5 studios. The modes are configured by dip switch configurations, on the rear of each unit. Two dip switches control the unit ID and there are two switches which decide between “studio” and “bus” modes. A master unit, defined by a preset ID, conducts all communication between all units. Relays are used for switching these specific paths leading to a passive, transparent audio path.